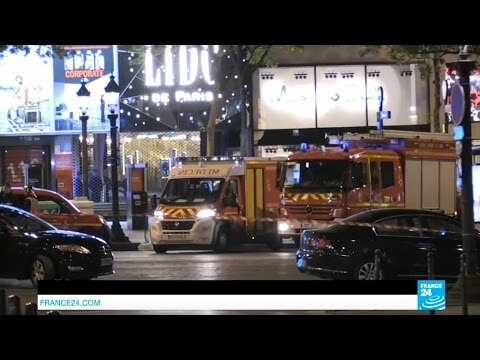 ISIL Terror-Trolls French Election, Supporting far Right; Will French Fall for It? Thursday’s shooting at the Champs Elysee, left one policeman dead, another gravely injured, a third lightly wounded along with a German tourist shot in the heel. It was carried out by Karim Cheurfi, a French national aged 39, born at Livry-Gargan in Seine-Saint-Denis. He had opened fire with a Kalashnikov machine gun and was killed by police at the scene. The site of the attack was politically symbolic in French terms, near the Arch of Triumph and the presidential palace. It clearly was intended to help elect the far-right candidate, Marine Le Pen. The question is whether the French electorate, which is pretty canny, will fall for this transparent terror-trolling. Cheurfi had a record as a petty criminal, having been jailed four times in the past 10 years for theft, assault and attempted murder. While in prison he showed no interest in Muslim radicalism, and only began talking like that from last December, when he said he was angered by deaths of Syrians. (France joined the US coalition bombing Daesh (ISIL, ISIS) in Raqqa, Syria, from late summer of 2015, on learning of Daesh plots to hit France, which it did several times thereafter). There are some twists on this story that raise question marks. Daesh very quickly announced on Thursday that they were behind this shooting. They made a significant mistake, however, in announcing that the terrorist’s name was Abou Youssouf Al-Beljiki. I.e. their operative was supposed to be Belgian. But Cheurfi is an ordinary Frenchman. So ISIL did not know who Cheurfi was, and Cheurfi or his handler did not know to say “Islamic State” rather than Daesh. Such incidents are murky, but I conclude that this attack was not a centrally directed Daesh operation. Cheurfi was until very recently just a petty criminal with no radical discourse, and he likely had never attended a meeting of the terrorist organization. He was happy to make his individual action look big and scary by attributing it to Daesh (without knowing enough to realize that this diction marked him as an outsider). Daesh itself was happy to claim responsibility unusually quickly. Whatever is going on here, it seems obvious that the shooting was an attempt to intervene in the first round of the French presidential election. In the first round, there are five major candidates. The two top vote-getters will then have a run-off. The question if neo-Fascist Marine Le Pen will be one of the two. Whoever plotted out the Champs Elysees shooting was trying to throw the election to LePen. As a white supremacist, she has taken a hard line against Muslims and immigrants as well as against minorities like the Jews. The recruiter who ran Cheurfi knew that an act of terrorism near the election could well shore up her numbers and make her look more credible. So you have the Republican Party candidate . Francois Fillon on the Gaullist, conventional right. He’s polling at 20 percent despite being implicated in a nepotism scandal. Then you have left wing Socialist Emmanuel Macron, who is the front runner in the polls, just ahead of Le Pen. the regular Socialist Party candidate – Benoît Hamon, who is polling well below 10%. The race is fluid and dynamic, so any of the candidates could pull ahead. Obviously, if Mélenchon starts doing slightly better, LePen could slip to third place and be out of the race. So I conclude Thursday’s shooting was intended to put Le Pen over the top and make sure she got into the run-off. The French public has seen a lot of this kind of thing and they are much more sophisticated than an American public would be over the difference between the vast majority of Muslims and the small fringe of radicals. The Daesh radicals want Le Pen to win because they know she will be mean to the French Muslims (5% of the population). They are hoping the French Muslims will be driven into the arms of Daesh. So the question is whether the French public will fall for the Trap of Daesh.